"The Komatsu products have allowed us to be very competitive in bidding, as we know we can count on the reliability and productivity of the equipment… Our relationship with AIS has allowed us tremendous flexibility, we know we can make one call and have our needs met." Terra Contracting is a company that covers a wide range of services. One of their main goals is to provide a single source, cost-effective solution for clients of all sizes throughout the country. Terra Contracting is a respected company that's been working in the field for more than 50 years. By providing their services following principles such as integrity, safety, and customer focus, Terra Contracting has grown from the company it was when it first started in 1952. "From rough terrain construction sites to landfills, the (Komatsu) HM400-2 has the competitive advantage." 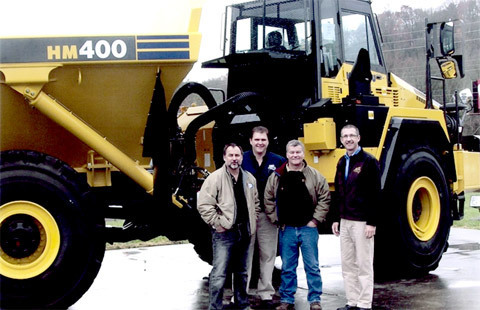 Terra Contracting Pictured: Left, Steve Taplin, owner of Terra Contracting, Dave Terbeek, Rental Operation Manager of AIS, Rich Anson of Terra Contracting, and Byron Miller, Sales Manager of AIS. Komatsu equipment is involved on almost every Terra Contracting job site. One of the machines that AIS supplied to Terra was the Komatsu HM-400 (pictured at right). The Komatsu HM-400 provided Terra Contracting with productivity and reduced maintenance costs. The HM-400 is designed with hydraulic articulated steering for light and easy maneuvering as well as a wide cab that offers comfortable operation and excellent visibility. Inter-axle and differential locks provide maximum traction for this articulated dump truck that features an “ecot3” environmentally-friendly engine.